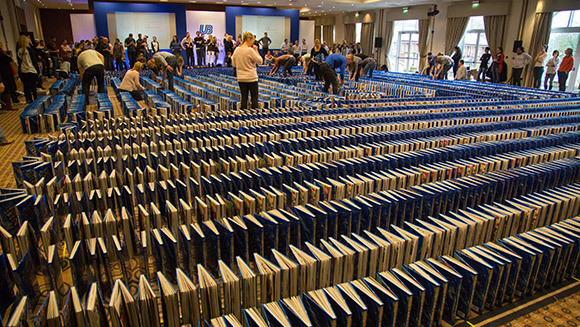 Back in January, employees of the UK-based United Biscuits lined up 5,500 books in a chain and knocked them down, domino-style, setting a new world record. The attempt was made at a sales conference in Old Windsor, England. it was developed in partnership with Guinness and sprung on United Biscuit's salespersons that morning as a team building exercise. it was a less than perfect effort; around a couple hundred of the 5,500 books didn't topple, but enough did fall that a new record of 5,318 books was set. The previous Guinness World Record of 4,988 books was set in March of last year in Cz?stochowa, Poland. Well that’s weird. I watched it before i posted it. let me see if i can find an alternative. WTF: “This video is private”! Like, what for? Like, didn’t you know that before you posted it? I watched the video before I posted it. And so did Piotr of eBookFriendly. It was public at one point. I have no idea why some fool at GBWR changed it.